I had a lovely visit from Niki at my scandinavian home some days ago. 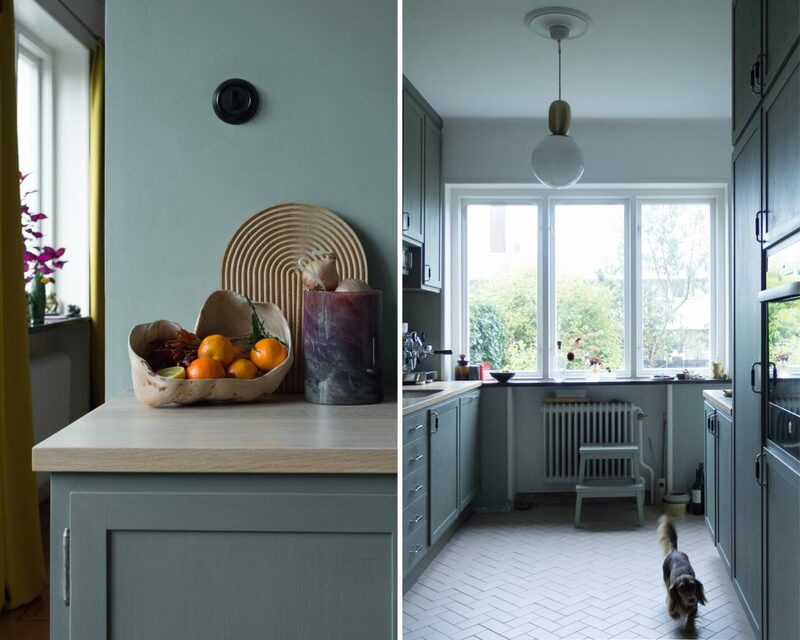 You can see her images here, but I would also like to share more pictures from our kitchen and more in-depth explanation of the renovation we did. Our house is from 1934, made in the early days of the “funkis” (functionalist design) era. When we moved in a few years ago it was more or less untouched with a lot of original details from the 1930’s. The kitchen still had parts of the original custom made kitchen cabinets, but modern appliances was added to the old structure and it didn’t work neither from a functional nor an aesthetical perspective. We decided that we would re-make the kitchen with inspiration from the original one and using details that were right for the 1930’s. We got the old glass containers from a friend that had renovated a flat from the same years and installed a modern kitchen. 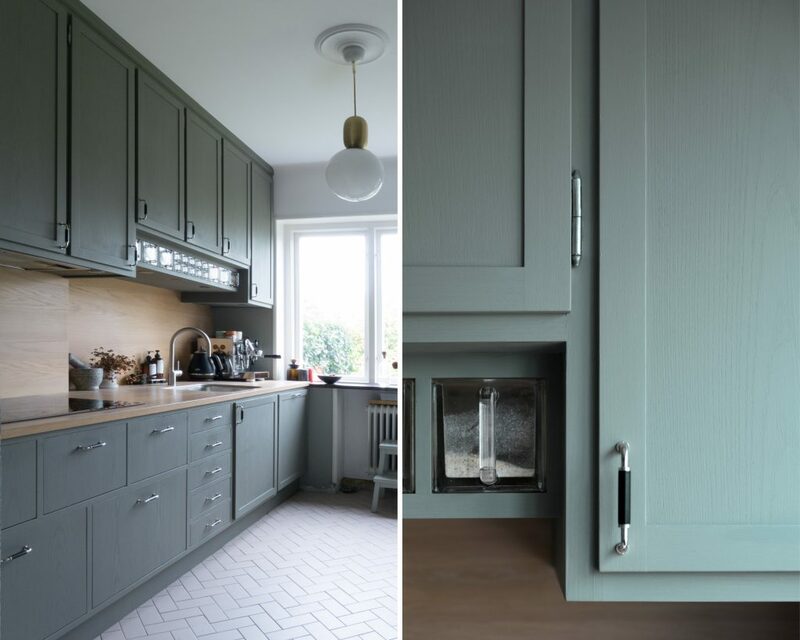 We contacted a local carpenter to help us build a custom made kitchen inspired by the original but with modern functionality. We found Christer Bentmon, the best carpenter ever! I made the drawings and he built it for us. We love our new kitchen and want it to live as long as the previous one, for more than 80 years! 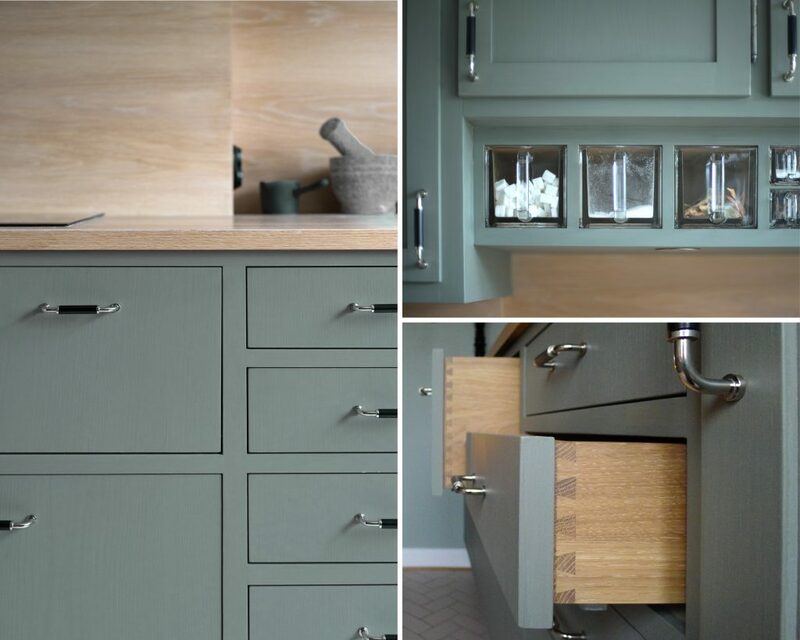 The cabinets and doors are made of ash because we wanted a wood with grains that would remain visible after painting. I painted all the parts 4 times (!!!) by hand. 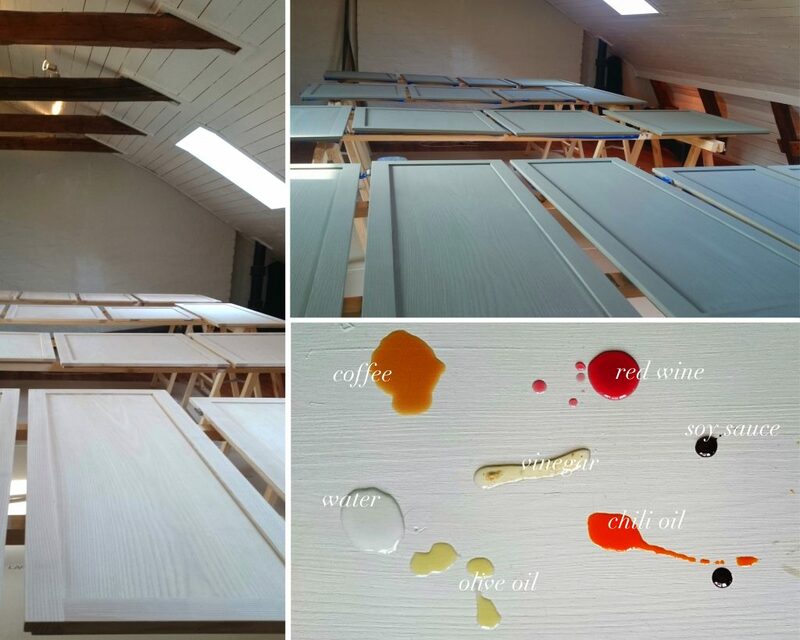 The first two layers of a traditional, ecological paint made of egg, linseed oil and natural pigments. I used the color 5-632 from Ovolin and it is an amazingly beautiful shade of green. It is a color that changes a lot with the light from cold to warm and with variation in color intensity. This kind of paint is quite sensitive to use in a kitchen, so I finished it with two layers of hard wax oil in matte finish from Osmo. As I am a bit “damaged” from my work as a Color and Material designer, of course I had to test different stains on the hard wax oil before deciding that it was the right coating. It passed my stain test and now we have a very functional and beautiful color in our kitchen! When we did the renovation we also removed a wall to open up the kitchen towards the entrance of the house, to get more light in the entrance area but also to get more storage space for our kitchen things. 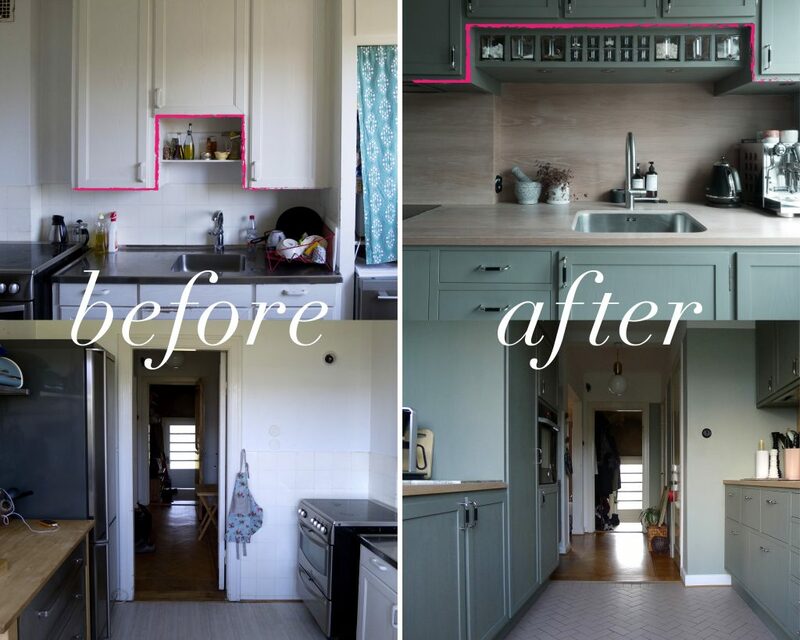 You can also see how the shape of the old cabinets was an inspiration for the new kitchen. Awesome article cheers for posting. warren. Previous Previous post: Organic lamp love!